I'm not into really sweet things most of the time but every once in awhile, I get a craving specifically for Nutella. This recipe was spawned from one such craving. I used this shortbread cookie recipe as a loose guide. I tend to avoid cookie recipes that require the dough to chill for a period of time, as is the case with most shortbreads; instead this recipe is super fast and only requires a few simple ingredients. 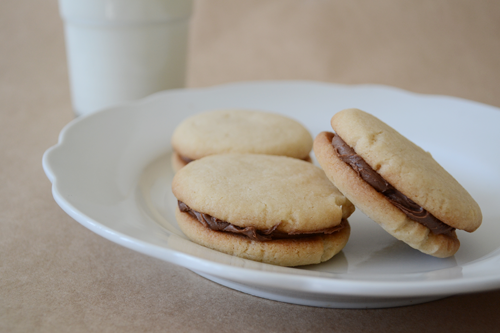 The shortbread cookies turn out slightly sweet, a little crunchy, and a little chewy, and they allow the Nutella filling to take the lead with flavor. Allow your butter to soften at room temperature. (Do not melt in the microwave as this will change the consistency of the cookies.) Preheat your oven to 350° Fahrenheit. Cream together the butter and sugar until smooth. Mix in the vanilla extract. Then, gradually add in the flour until the dough comes together. Roll the dough into 1-inch balls and place them about 2 inches apart on an ungreased cookie sheet. Using the palm of your hand, press each ball down until it is flattened to a little less than half of its original height. Bake the cookies for 15 minutes, or until the edges start turn a light golden brown. Remove the cookies and allow them to cool. 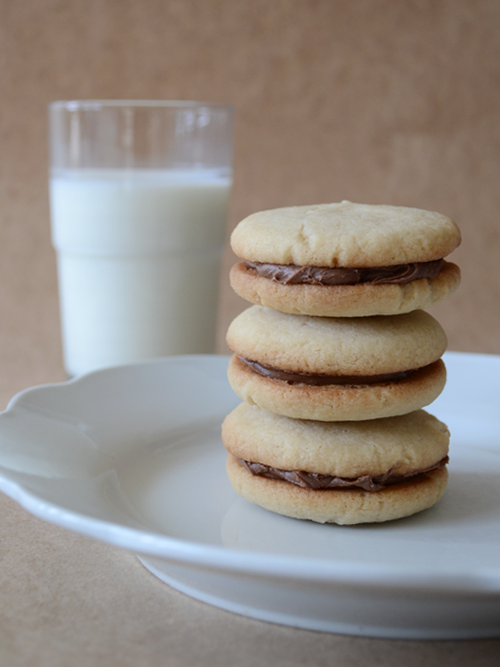 Overturn one cookie and spread the desired amount of Nutella on the flat side. Place another cookie flat-side-down on the Nutella filling. Repeat with the remaining cookies. These look so cute and easy to make! Love it! these look delicious! i will be making these this weekend. thanks so much!